The Horton House: Santa! I know him! Last night we made our 2nd Annual trip to see Santa. (Last years trip is HERE.) I was pretty confident that Barrett wasn't going to be a fan but he seemed so excited when we got there that I was hopeful. All the way there we talked about Santa and this was his face when he saw him for the first time. I had to hold him back from running up to him before it was our turn. Then it was our turn..
Santa gave him some candy and he threw it down like a brat. I intended to get his outfit monogrammed but I'm glad I didn't waste my time because you wouldn't have seen it anyway. Santa had the death grip on him because he was trying to escape. I did manage to get a few not terrible ones. I can't believe how much he's grown since last year. Yes, that's my kid playing with the truck in the middle of the floor like he's the only one around. He didn't like the table they had set up because he wasn't tall enough. So he just put the truck in the floor to play. Then we decided to let him ride the carousel. He liked it last year. He cried and cried. I guess I should have just gotten him off but I thought he would enjoy it once it got moving. I had no idea it would be torture for him to ride. He eventually quit crying bu the never loosened his death grip. Later into the ride he pointed to the reindeer in front of us. I asked him if he wanted to ride the deer and he said yes. Of course he says yes to everything so who knows it that was really the problem. He did not love the elevator ride. He was in the buggy and when the doors closed he started shaking and crying. It was the saddest thing. Who is terrified of elevators? He definitely convinced Patrick that we are still several years off from our first trip to Disney. And just for fun...these two pictures crack me up. Apparently our kid is a model and we can't keep our eyes open. All in all it was a wonderful family night out. 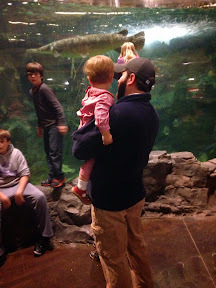 We've always loved Bass Pro Shops to visit Santa, my advice is if you go during the week try to get there before 5:30. The line was very short when we arrived and was very long when we left. One thing I noticed though and I'm not sure if it was just because the few kids I watched were young but Santa didn't ask them what they wanted. If the kids didn't just pipe up with their list he didn't hear it. Other than that though it was a great set up. I just love my little guy (and big guy) so much. I love these little memories. I also apparently love that scarf that is on repeat this season, ha!. I can't believe Barrett will be two in a week. Time slow down.